For years, opponents of electronic cigarettes have been screaming from the top of their lungs that vaping was renormalizing smoking and acting as a gateway to tobacco cigarettes for youth. 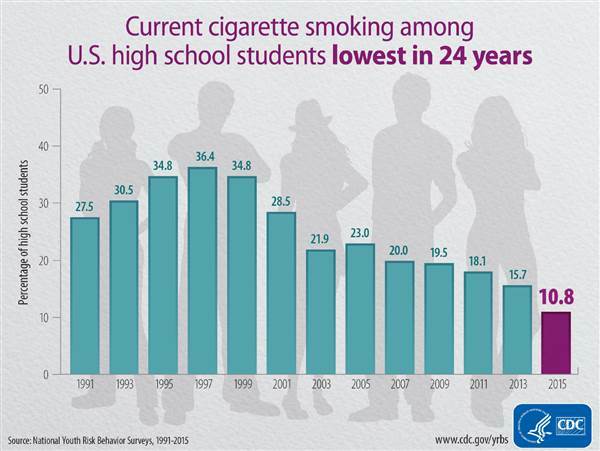 There were even a number of controversial studies and surveys that suggested the same, but, according to a national survey conducted by the CDC, the number of teen smokers continues to drop, despite the rise of electronic cigarettes. The Center for Disease Control and Prevention has been at the forefront of a movement warning the general public about the danger posed by electronic cigarettes. 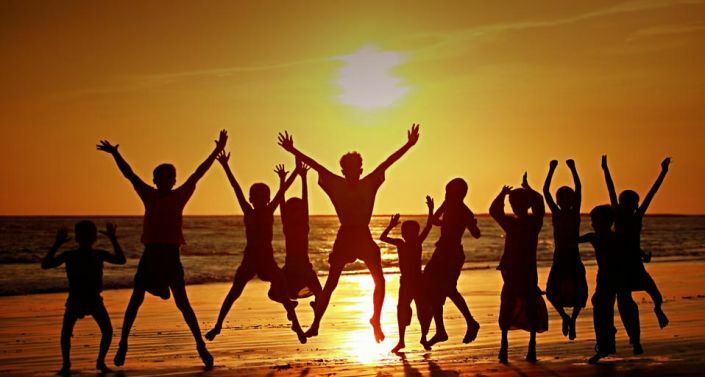 It all started in 2013, when then-Director of the CDC, Thomas R. Frieden, emphasized the need to “make sure that e-cigarettes don’t lead to another generation of kids becoming addicted,” and to monitor the “concerning trend” of increased e-cigarette use among youths. E-cigarette use among teens had indeed been steadily growing since 2011, when the CDC included vaping in its annual National Youth Tobacco Survey (NYTS), but, between 2013 and 2014, it just blew up from 4.5% of high-school students in 2013 to a whopping 13.4% in 2014. By 2015, the ratio of students having reported using e-cigs in the month leading up to the survey had reached 16%. 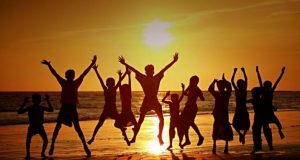 Opponents of vaping started using these statistics to justify their warnings that electronic cigarettes were getting kids addicted to nicotine and pushing them to smoking tobacco, conveniently failing to mention that while the percent of youths who had tried e-cigarettes was going up, smoking was steadily declining, and that most of those kids who had tried e-cigs were probably just experimenting, not using them regularly. 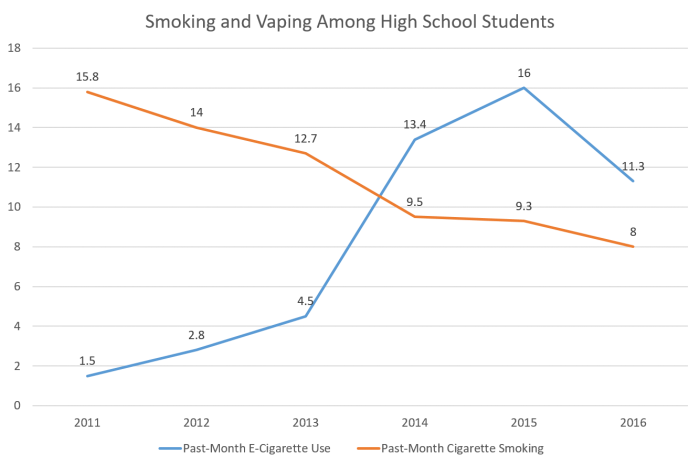 However, last year, something interesting happened – both the number of middle-school and high-school students who reported using e-cigarettes and those smoking cigarettes, dropped significantly, compared to previous years. 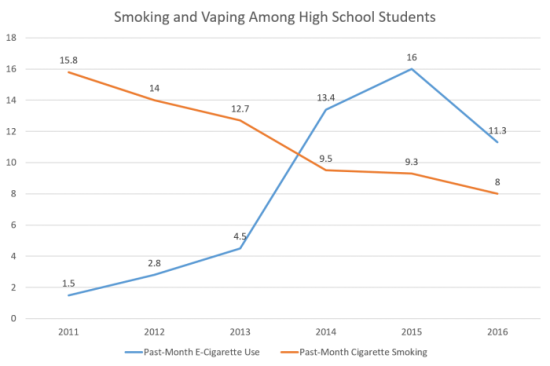 According to the 2016 National Youth Tobacco Survey, the incidence of cigarette smoking among high-school students dropped from 9.3% to 8&, while that of vaping among the same age group plummeted from 16% to 11.3%. Translated in actual figures, the number of teenagers using e-cigarettes fell from 3 million in 2015 to 2.2 million in 2016. That’s a huge drop for just one year, and it goes against everything the CDC and other organizations have been warning us about in the last five years. Not only is smoking prevalence among teens still dropping, but now e-cigarette use if going down as well. So what caused this sudden change in the trend? According to the CDC, the recently implemented FDA e-cigarette regulations, which, among other things, ban the sale of vaping products to minors, have played a great role in the drop. But, it’s worth mentioning that even before the regulations came into effect last year, all but 2 U.S. states had already banned e-cigarette sales to minors. The more likely explanation is that electronic cigarettes are not new anymore. They’ve now been around for over a decade, and children aren’t as curious to try them as they were a few years ago. 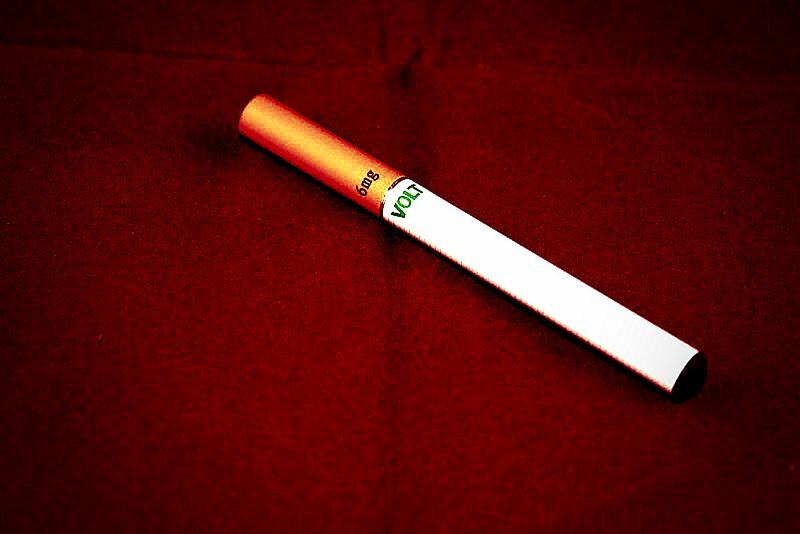 And try them is most likely all they were doing anyway, as everyone knows teenagers like to experiment, although there is no way to tell for sure, because the CDC survey simply asks them if they had used an e-cigarette at least once in the last 30 days. That’s definitely not the definition of a vaper. If anyone asked you if you had a drink in the last 30 days, and you answered “yes”, does that make you an alcoholic? Anyway, the main takeaway of this CDC survey is that smoking prevalence among teenage kids has been going down both when the rate of vaping was going up, and it’s still declining now that vaping prevalence is on a downwards spiral. So how can they still push the narrative that e-cigarettes are a dangerous gateway to smoking for youths? Well, they can’t, which is why they don’t really want you to know the detailed findings of their national survey. The CDC simply concludes that the use of tobacco products in general did not change “significantly” from 2011 to 2016, which makes sense if you don’t draw any distinction between e-cigarettes and products with actual tobacco in them, like cigarettes and cigars. Because e-cigarette use had been on the rise up until last year, it counter-balanced the steady decline in tobacco smoking. Basically, the aggregate rates of use across all products masks the divergent trends between most forms of combustible tobacco products, and electronic cigarettes, allowing the CDC and other organization to shamelessly push their agenda and paint vaping as the Big Bad Wolf out to get our kids. In reality, their data shows just the opposite. Siegel adds that the drop in e-cigarette use among teenagers is “reassuring”, as it indicates that most kids were simply experimenting with vaping, not becoming regular users. This also suggests that e-cigarettes are not as addictive as tobacco cigarettes, which has already been confirmed by several scientific studies. The “gateway to smoking” theory has already been debunked by research, but it seems that even when their own data shows that it is unsubstantiated, the CDC and other “public health” organizations are not above spinning the facts to push their agenda.